We're getting super cheesy for Valentine's Day. We're hosting Philadelphia-famous curd whisperer Alex Jones of Collective Creamery for a private cheese making class with a live demonstration of mozzarella making, followed by a cheese + beer pairing (and eating, and drinking), plus plenty of cocktails in between. The Cannery will be closed to the public during this event, so expect an intimate, seated ambiance with plenty of time and space to talk, ask questions, and enjoy. We're capping this at 22 people, and tickets are first-come, first served so reserve your spot now! 6PM Arrival + welcome cocktail - your choice! Check out the new additions to our just-updated cocktail menu including Guavagool, Koopa Trooper Smash, Winter Tonic, or whatever your heart desires. You can opt for beer or wine, instead. 6:15PM Grab a seat and settle in with your drink as Alex demonstrates how to make mozzarella. She'll explain the ingredients and the process, make a batch while you watch, and maybe let you taste some along the way. We'll hook you up with some ingredients to take home and make a batch of your own. 7:15PM Cheese and beer pairings - Alex has selected a beautiful curation of local, artisanal cheeses from Valley Milkhouse and Collective Creamery to serve with baguettes, and we'll be pairing them with our fresh-to-death in-house beers for your eating/drinking pleasure. Price includes a welcome cocktail of your choice, a mozzarella making demo, take-home ingredients so you can make it yourself - just add raw milk! - and cheese, baguette, and beer to enjoy after the demo. Additional cocktails, beer and wine will be available a la carte. Alex Jones is a cheesemonger, writer, food educator, and regional food systems advocate who has been working with farmers and artisans in Pennsylvania for the past seven years. She is one-third of the team behind Collective Creamery, a women-powered artisan cheese subscription based in southeast Pennsylvania, and has written for publications like CivilEats.com, Edible Philly, Edible Jersey, Grid, and Foobooz.com, Philadelphia magazine's food and drink blog. 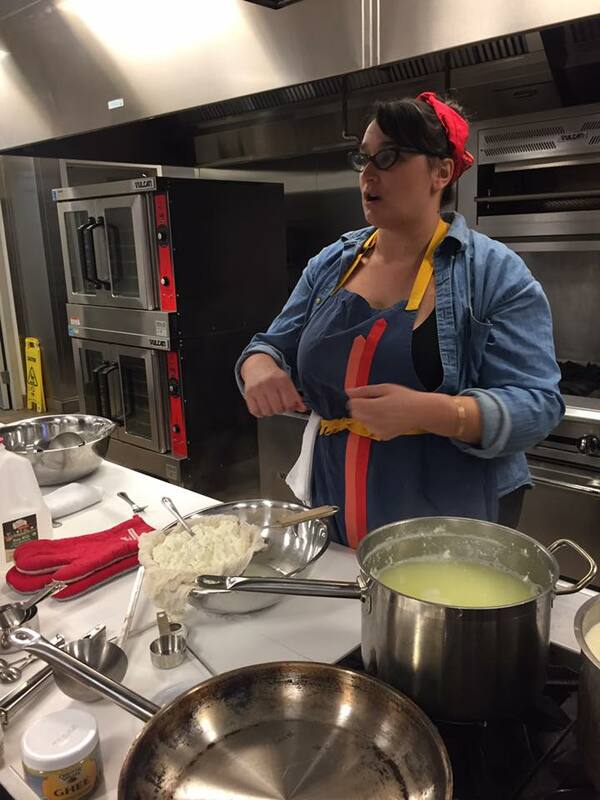 She teaches cheese appreciation and pairing as well as home cheesemaking in and around Philadelphia. Alex teaching a ricotta making class at the Free Library of Philadelphia Culinary Literacy Center. We opened this space in Spring 2017 as a mixed-use space for canning during the week and cocktailing Thursday through Saturday. At the Cannery, we've hosted everything from Tattoo parties to monthly Comedy Nights (check out #ComedyAtTheCannery at the end of each month!) to Glassblowing Demos. We through a mean private party in here, too. The Cannery is pretty different than the main brewpub - it's smaller, more intimate (but a bit more industrial, at the same time -- you'll be drinking right next to our fermentation tanks and canning line) and is more centered on cocktails and beer cocktails that feature spirits from PA-makers including Boardroom, Five Saints, Lo-Fi, Rowhouse Spirits, Faber, Wiggle, Dad's Hat and Bluebird.